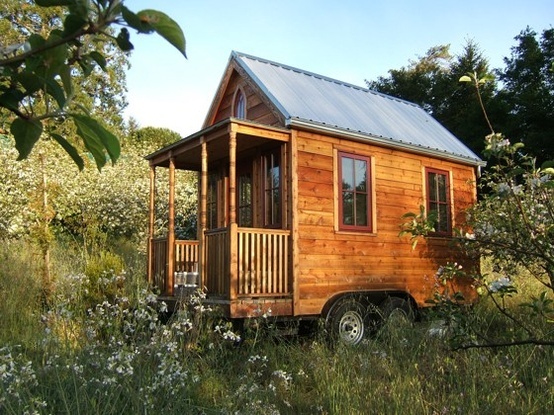 1) Tumbleweed Tiny Houses- truly tiny homes which are sized between 65-884 square feet. 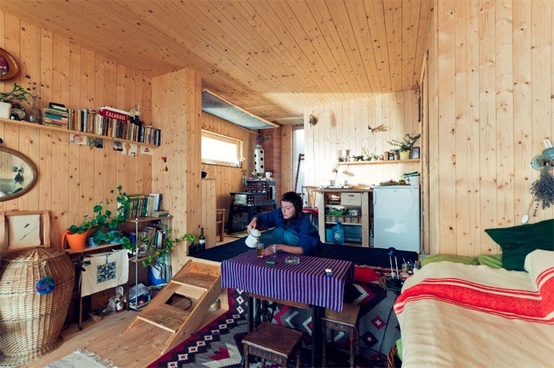 Their website features House-to-Go plans for portable homes as well as baby cottages. We are friends with a couple who built their own Tumbleweed House-to-Go. 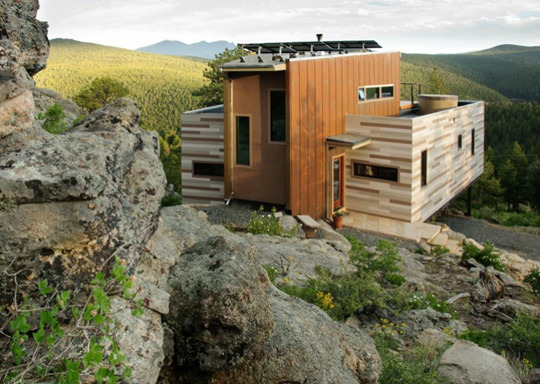 Their tiny house is powered via a solar panel and they also have a composting toilet system, so they are almost off-the-grid. They are actually about to move from Washington to Louisiana and will be able to take their house with them. I plan to feature them on this blog later on as I love their house! It's really cosy and inspiring. 2) Cargotecture- houses made out of either used or new shipping containers. These houses are relatively affordable to build and are pretty much indestructible. Shipping containers can be cut to specifications or there are some companies catching on to the trend who have started selling containers with different sides missing (for stacking multiple containers together or side by side) or with pre-cut window and door holes. Shipping container homes can be used for minimalist tiny homes or can be stacked together to create multi-family condominiums. Many of the shipping container houses I've seen online have their industrial metal walls covered up with siding and drywall, so they are used like a prefabricated frame. I learned that many shipping containers come to the US and just sit here, stacked up in empty mountains, as we do not export goods as much as we import them (another reason to try to buy things made in this country). Thus, finding a use for these shipping containers is ecologically responsible. 3) A Post or Timber Frame House- we also considered a post or timber framed home. 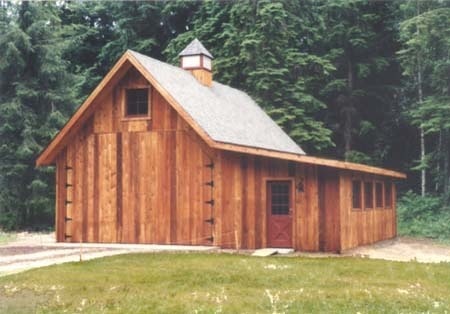 Post and timber framed homes are typically made with a combination of industrial steel or plywood sheeting and wood and include a frame supported with strong poles (they are also called pole barns). Because of these materials and poles, the framed structure is very strong and does not require interior supporting walls. This makes post and timber frame homes very affordable as they take far less materials and labor to build. Above is the current floor plan we like. 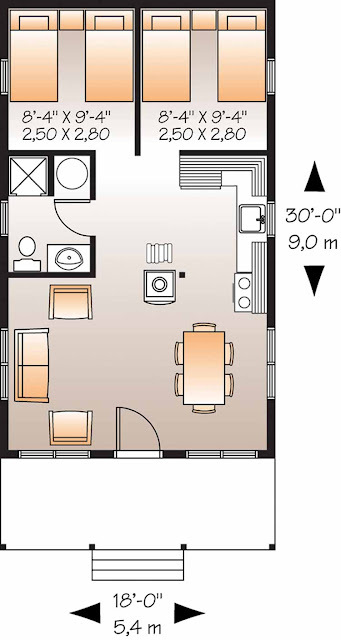 We've been studying many different floor plans and this one seems to make the most sense to us. We like the open kitchen and living room area. We always wanted an open living space, instead of a hidden away kitchen, as everyone wants to spend time in the kitchen anyway. We figure this open living space will grant us more options for furniture and entertaining layout as well. 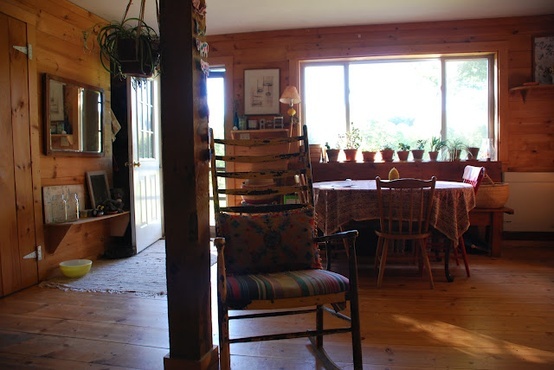 The square at the center of the living space is supposed to be a wood stove. 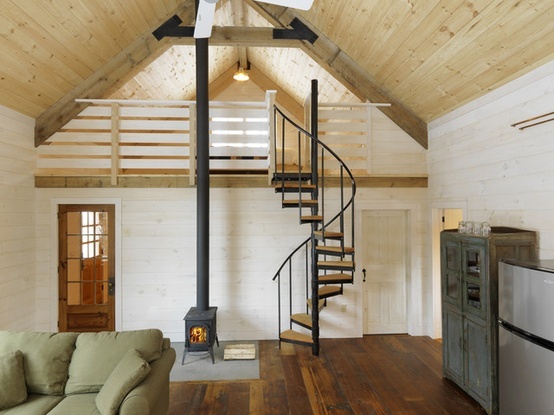 I would prefer to move the wood stove to very left corner as it seems to be in an awkward spot in the center of the room. As far as the bathroom, one is enough for us now. We currently only use one bathroom in our house, even when company comes over. I don't need a private bathroom as I don't really mind sharing a bathroom with my guests. It's always been that way for us. I measured the bedrooms out on the floor with measuring tape to try and visualize how big (or small) they are in reality. They are actually pretty spacious. Enough for a bed, dresser and mirror, which is the only furniture we have in our current bedroom anyway. If we purchase a low-profile bedframe with space for storage underneath and hang shelves, I'm sure we'll have ample storage space for our clothes and belongings. 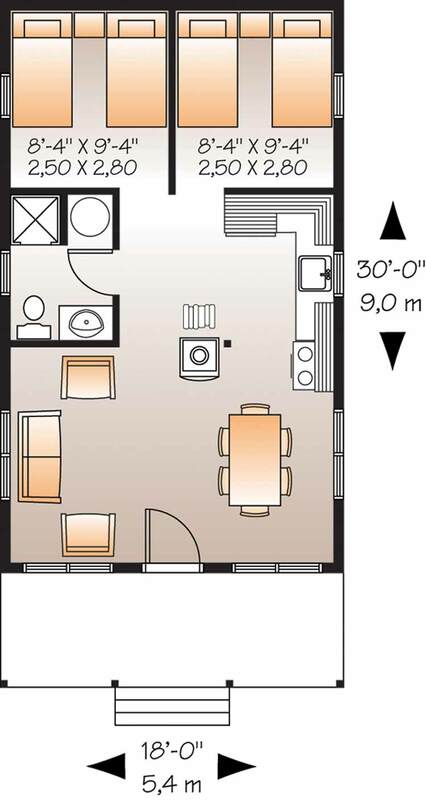 We are planning on adding a few extra feet to this floor plan to accomodate linen and storage closets, as well as a closet or small room for a stackable washer/dryer unit. 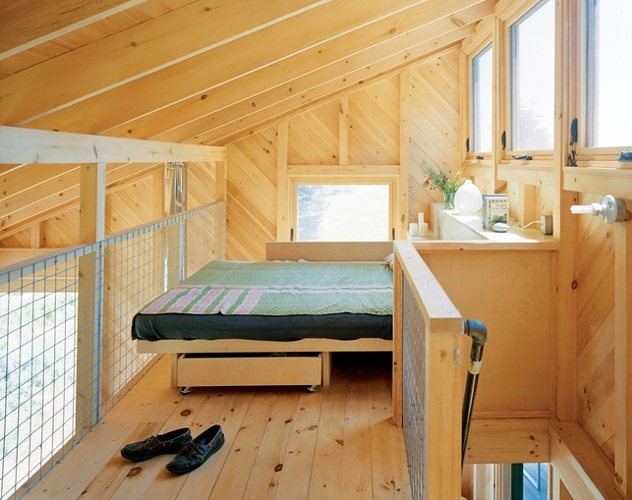 We're also considering adding a small loft for a bedroom, depending on costs. Then we'd definitly have room. We like this plan because we figure we could easily build on to it later in life if we do need another room or two. For now, it's just the right size for us. Having a smaller, energy-efficient home means we'll probably be warm and cosy in the winter months (we're currently freezing in the large older house we live in due to heating costs) and we'll be more connected to the outdoors in the summer. Speaking of which, we really want a large deck attached to the front of the house from the living area. 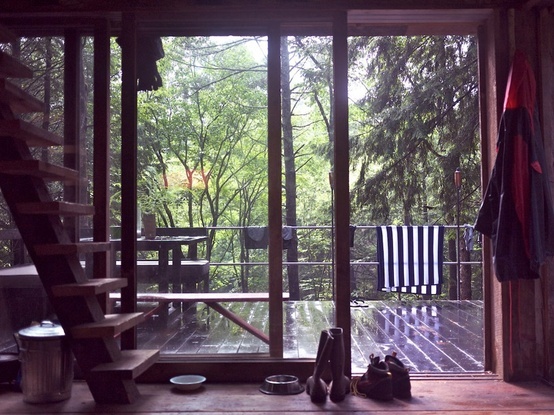 I can imagine having friends and family over in the summer to lounge on our deck in the woods after a day of rowboating around the lake. 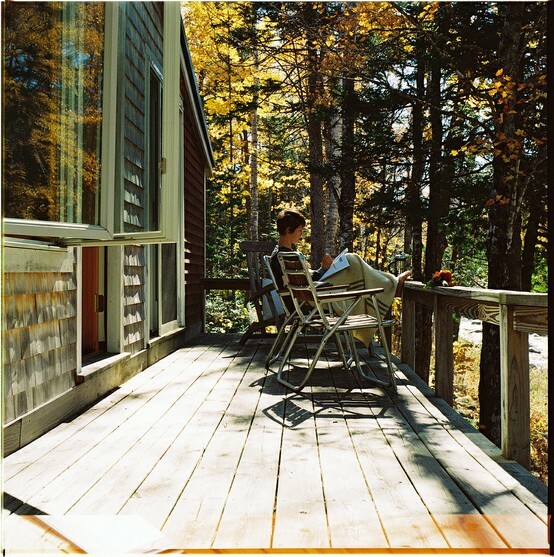 Covering and screening in the deck might also make it more Pacific Northwest friendly while adding to our home space in a way, like an outdoor room. As far as indoor aesthetics, I really love the look and feel of wood paneled walls. The current house we live in has a 1970s addition with warm-brown slanted wood paneling. 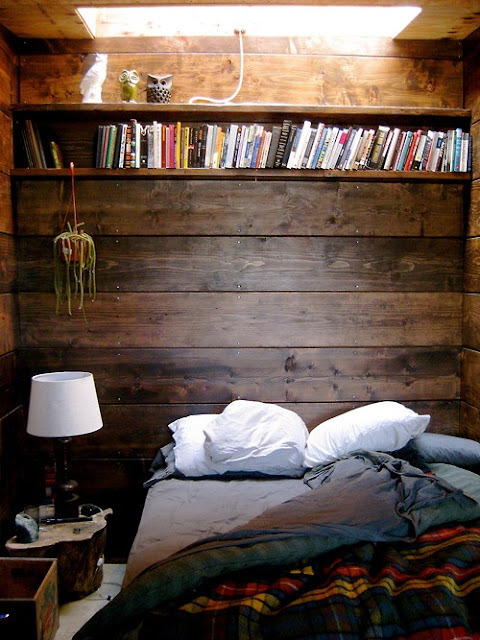 I adore the look and would like my new home to have this instead of drywall. 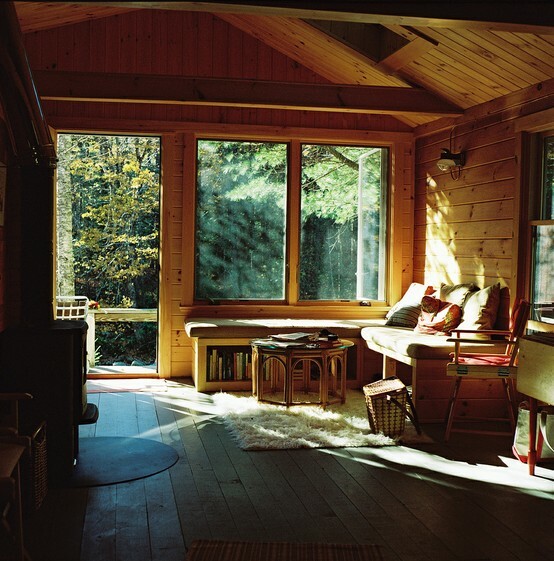 Wood paneling is more natural to me and adds interest to a room. 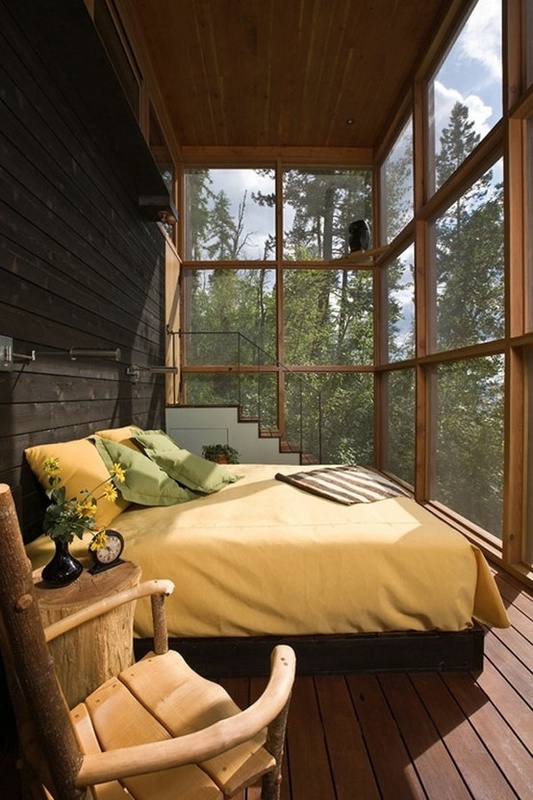 I also think it will fit our cabin aesthetic and our forested property. Anyway, these are probably enough details for now. We are very glad that we have agreed on a general plan for our home. I'll be sure to post more as our journey progresses.